…stopping at every pub along the way! It would be quicker to take the new high-speed motorway but where is the fun in that? 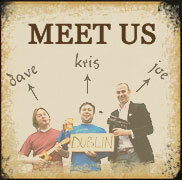 Thirty years ago the drive from Belfast to Dublin was an event and David, Kris and Joe want to find out why? Nowadays we are all time poor – then we were cash poor. How much has the soul of our society changed through affluence on our island? Were we a warmer people then, untainted by the big green tiger? Or did the lads just fancy harking back to the tradition of knocking back a pint in every pub along the road? All these questions are answered in an anarchic, drink fuelled haze, stopping at hostelries and meeting characters that show the best and worst we Irish have to offer the world. Keep an eye out for our 'pub-crawl screenings' of the full film in an area near you. 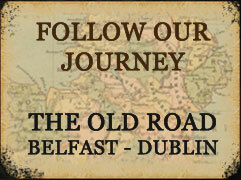 E-mail us on oldroad@notasuch.com if you would like to organise a screening in your area.